What: For My Breakfast Reading Program, syllabication is the process of dividing longer unknown words into smaller parts that will allow the student to apply phonetic rules (pancake, waffle, orange juice, and diphthong) in sounding out the smaller parts. Why: As the student progresses in reading, he or she will be confronted with multi-syllabic words. Up to this point, My Breakfast Reading Program's core focus has been on single syllable words. The student must be able to quickly separate the longer word into smaller parts before applying the basic phonetic rules. An additional concept of accent must also be introduced. The ultimate goal is to decipher the unknown word within 3 - 5 seconds. Thus applying all the rules and concepts have to become fluent. How: As with the materials for single syllable words, My Breakfast Reading Program uses breakfast food analogies to emphasize the rules and attempts to keep the rules to a minimum. Once a word is divided into smaller parts, the single syllable rules/analogies can be applied to each smaller part. The last phase of working with multi-syllables is to sound blend the blended parts until the word is recognized, if within the student's speaking vocabulary. My Breakfast Reading Program provides a downloadable Microsoft Excel worksheet for syllabication materials. Following are the breakfast food analogies and rationale used for teaching syllabication in My Breakfast Reading Program. Grapefruit Rule: A student should look for known words within the word. In general, these are compound words. In addition, the student should also look for known prefixes and/or suffixes. This rule is using the student's existing knowledge, particularly if the word is presented in connected text that also allows contextual clues to be applied. In many cases, identifying the word parts (grapefruits) will provide the student the skill to decode the more complex word. However, sometimes a student may not recognize the compound words, prefixes and/or suffixes. Find the vowel or vowel pair. Look at the next two letters. Are there any special blends or digraphs? If so, cut the syllable in front of the blend or digraph. Otherwise, look for donuts, muffins or maple syrup. Repeat for the next syllable, if needed. Donut Rule: If the next two letters are a consonant and then a vowel, cut the syllable in front of the consonant. This will create what many call the "open syllable". donut becomes do - nut. clover becomes clo - ver. Dealing with the accented or non-accented syllable: My Breakfast Reading Program does not follow the true dictionary hyphenation of words. Why? As stated above, the process is used on unknown words. So what is the difference between the hyphenation of river and clover? It has to do where the accent is placed. Traditionally for two syllable words, if the accent is on the first vowel, it will be hyphenated between the first vowel and consonant (clo-ver), making the open syllable pattern and the vowel long. If the vowel is not accented, then it will be hyphenated after the vowel and consonant (riv-er), making the "closed syllable" and thus the vowel sound short. But here is the Catch 22. If the student doesn't know the word, how will they know where the accent is placed? Therefore, My Breakfast Reading Program recommends that the student always create the open syllable pattern by separating the initial vowel from the following consonant if the next two letters are consonant and vowel, as in do - nut, thus the DONUT Rule. The student should first use the long sound (accented) for the vowel, blend both syllables and check for recognition. If not recognizable, the student should then use the short (unaccented) sound and reblend both syllables and check for recognition. The trying/retrying of the long (accented) and short (unaccented) sound becomes even more critical when you have three and four syllables. Try sound blending the following words using both the "dictionary accent rule" and the DONUT Rule. If you hadn't known the word ahead of time, what consistent strategy would you apply? Keep the rule simple and try the long sound first and then the short sound. Examples of words that follow the "dictionary accent rule" and the DONUT Rule. Examples of words that follow the "dictionary accent rule" but can still be sounded out using the DONUT Rule. Once the word is recognized, you can then discuss the accent rule and reapply the dictionary hyphenation. Muffin Rule: If the next two letters are both consonants (already ruled out blends and digraphs), cut the syllable between the two consonants. This will create what many call the "closed syllable" and the vowel sound will be short (unless the vowel pair is an R Controlled or diphthong). However, it doesn't make any difference if the two consonants are "twins" or not. Maple Syrup Rule: If the word ends in "le", cut the last syllable so that it has the "le" and the consonant in front of the "le". Since maple syrup is sticky, the consonant in front of the "le" sticks to the "le". Generally, this is a secondary rule in that you wouldn't cut the "blend" that precedes the "e". Since the goal is to quickly recognize word parts, as in the grapefruit, this rule can help quickly recognize word endings. 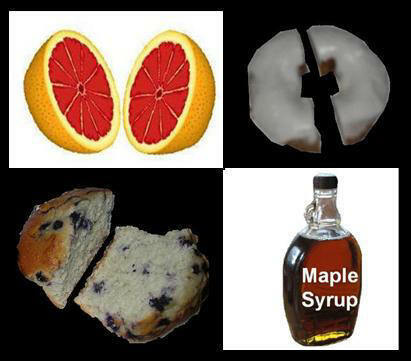 That is, the following examples could use either the "blend" rule, the "Muffin Rule" and/or the "Maple Syrup Rule".